AS YOU WERE. . .
Tiger Moth Rib Jigs for full sized ribs and aileron ribs. Gil Bourrier demonstrating how to use the rib jig. the camber on the underside of the rib. Checking over the lower left wing's unique characteristics. and repair ribs if needed. Cutting rib stitching while removing fabric. The Brandon CATP Museum, Brandon RAA, Winnipeg Area RAA, and Canadian Aviation Historical Society met at the RAA Workshop Final Assembly Building March 8th for an evening workshop on building Tiger Moth Ribs. About 20 people came out on a blustery winter night. Unfortunately the RCMP closed the Trans Canada Highway due to black ice and blowing snow, keeping most of the Brandon participants from attending. 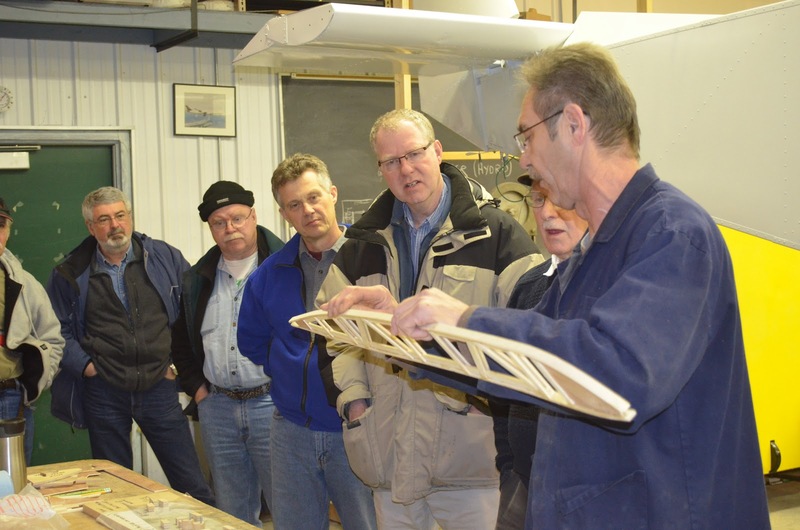 Harvey McKinnon, Brandon CATP Museum Pilot, explained that the Museum had three flying airplanes – Cornel, Stinson and Harvard…and one day the Tiger Moth will be added to the flying vintage fleet! This Tiger Moth was built in 1938, last flew about 20 years ago, and has been on static display inside the hangar ever since. It is now being restored in a joint project with Brandon and Winnipeg area RAA Members. Tom Phinney and his son have volunteered to be the AMO: Fabric and Wood for the project, Ted Hector has volunteered to be the AME. Volunteers working on the project include neighbours, experienced builders, and pilots. Gerald Ricard, Transport Canada, is providing advice needed to ensure the paperwork is all brought into order. His colleague, Garnet Fedorowich, Transport Canada, is familiar with this Tiger Moth, he was working in Brandon when it first arrived at the museum about 40 years ago and has followed its repairs and uses with interest. Garnet has been invaluable helping recover some of this history. Bill Gibson drops in regularly with precious insights. Bill actually flew this Tiger Moth many years ago and has brought in invaluable documentations on rigging specifications! Neil Davidson, a re-known vintage aircraft restorer from BC, has provided a microfiche filled with rare drawings, which the University of Manitoba is in the process of copying for the museum. 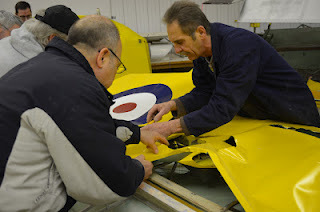 Neil Davidson and the Tiger Boys from Guelph, generously share their many decades of experience working on Tiger Moths, and other antiques, from around the world with us as we slowly uncover questions as the restoration process proceeds. 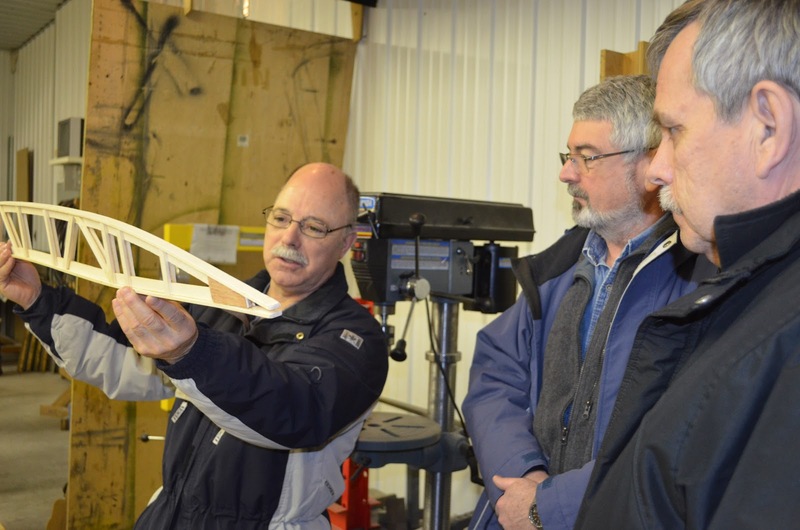 In preparation for the Tiger Moth rib building workshop, Gil Bourrier created four jigs, two for aileron ribs and a 2-part jig for making wing ribs. Gil began by fitting a stiff piece of cardboard over the spars and wires so he could trace around the entire full-sized rib…with that classic cambered lower edge that the Pietenpol builders recognized in their own projects. He mounted this pattern on a sheet of plywood, covered the pattern with clear plastic, and then strategically positioned spacers and clamps to guide and hold the cross pieces and cap strips in place. The clamps were round pieces of wood screwed onto the plywood so they could be rotated to press the cap strip tightly into position. Before beginning to build a rib, a collection of vertical and diagonal braces need to be cut from 1/8” thick spruce. Braces are placed in about seven positions along the rib. The brace for each position is a different length and the angle of the cut at the top and bottom is unique…good idea to cut a whole bunch simultaneously; so all the braces for one station are identical. Spruce cap strips and gussets are also prepared in advance. 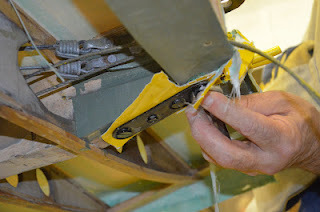 Once all the pieces are prepared, some two-part epoxy glue is mixed and the braces are glued to the upper and lower strips placed in the 1st jig. Cap strips are placed in the jig as spacers; cap strips aren’t glued at this point. Once the glue is set, the partially constructed full-sized rib is removed and placed in the 2nd of the 2-part jig designed to hold the cap strips while they are being glued in position. A 2-part jig was needed because the Tiger Moth rib design has a ‘T’-shaped cap strip with braces added to both sides of the ‘T’. Participants took a close look at the jig and actually tried fitting in the pieces to understand why everything wasn’t just glued at the same time in one jig. Larry Brown then helped point out some of the highlights visible in the lower left wing currently being repaired. The all wood structure is braced with steel drag and anti-drag wires. The wires are attached to an adjustable eye with a hand spun coil of steel! This coil is made by hooking the steel onto a lathe, spinning the lathe a few turns, and then slipping it over the drag or anti-drag wire! The aileron control rod is moved with a basic bicycle chain, with a handmade fitting attaching the chain to the control cables. A bicycle sprocket is connected to the aileron control rod, just like a pedal on a bicycle! It works extremely well, even after 70+ years of service! A few of the ribs on the lower left wing were broken, splintered, or loose. Over the last month or so, cap strips have been soaked in steaming water, clamped to a mold and allowed to dry into the original shape of the rib nose. Once the piece is dry, it is then glued into position, clamped, and left until dry. This process is repeated, one rib at a time, and slowly the wing is returning to its original airworthy condition. 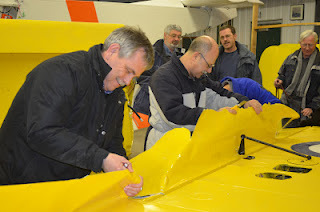 Straightening and re-gluing has also been completed on the leading and trailing edges of the wing and aileron. Soon both these pieces will be ready for varnish and prepped for fabric. 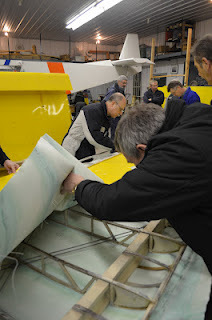 About half way through the evening, we got to see the lower right wing, fully covered with fabric, just as it was when it was de-assembled from the fuselage last December. One of the goals for this event was to remove the covering and begin inspecting this wing for damage that needed repairing. Welding numerous knives, a marking pen, and camera; the entire team began removing the fabric. Carefully cutting the hundreds of stitches, making notes on the fabric, which will be used as a pattern when we begin recovering the wing, and photographically documenting each section, slowly the original Tiger Moth wing was uncovered. The spar attachment fitting was removed. Following British procedures, the nuts were ‘locked’ onto the bolts by bashing the last thread to prevent the nut from falling off. To remove the nuts, the last thread has to be cleaned up with a file and then the nut is easily removed with a set of British Wentworth socket wrenches lent to us by Vic Préfontaine! The lower right wing appears to need fewer repairs than the lower left wing. The paint will be partially removed to check for any wood rot, hidden fractures, and other abnormalities. With 20 people, it didn’t take long to get a lot of work accomplished. 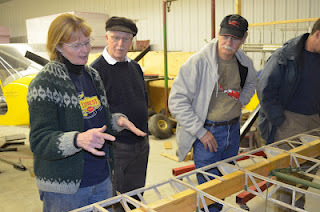 You are invited to drop in to help prepare this wing for any repairs and varnish bothy wings as we get them ready for fabric. 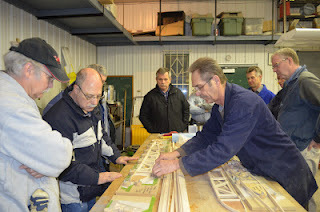 March 15th, Thursday, at 7:00 pm in the RAA Workshop Final Assembly Building at Lyncrest, there will be a mini-fabric covering workshop…maybe we’ll get to put the fabric on the Tiger Moth aileron and take one last look at the original data plates, handwritten part numbers, and other original documentation found beneath the fabric. One day, this Tiger Moth will be back flying amongst the clouds on a beautiful summer day over the Brandon airport. Yes, it is a two-person aircraft and the Museum is planning to allow rides! Contact jill_oakes@umanitoba.ca if you’d like to volunteer, we’re working most weekends from around 9:30 to Noon with some work done in the afternoon and some weekdays and evenings. Bill Hillman's AS YOU WERE . . .